Golden Dawn party deputy Ilias Kasidiaris on Monday violently pushed New Democracy parliamentary spokesman Nikos Dendias because he walked in front of him while he was addressing the House. Kasidiaris was speaking to the Parliamentary Financial Affairs Committee from his seat when the ND lawmaker happened to pass in front of him while going to take his seat. “Not in front of me! Can’t you see I’m speaking?” Kasidiaris shouted and Dendias stopped to ask him why he was shouting. “What kind of attitude is this?” the Golden Dawn lawmaker said. 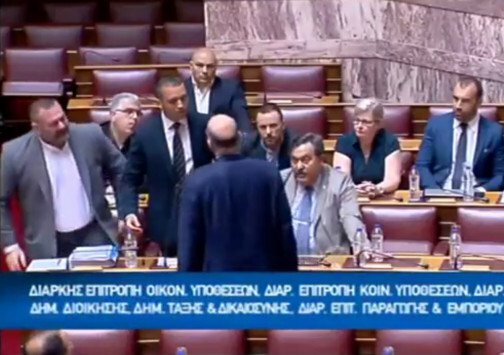 The parliament camera moved away from the two men and later everyone in the House said that Kasidiaris pushed Dendias violently while GD lawmakers threw water at Dendias. Kasidiaris then proceeded to verbally abuse the ND lawmaker. All members of Golden Dawn shouted abuse at Dendias and other New Democracy MPs. When the deputy parliament president asked Kasidiaris to leave the room, the Golden Dawn MP refused and the deputy called the guard. Meanwhile Kasidiaris’ colleagues shouted abuse at all present in the House. Meanwhile, committee chairman Makis Balaouras ordered Kasidiaris’ immediate removal from the parliament. Balaouras filed a motion of censure against Kasidiaris and the entire parliamentary group of the extreme-rightist party. His censure was accepted. After the event all parties condemned the violent incident.